Over the years we have tried to increase awareness of this somewhat obscure breed as we believe the Manchester's future depends on outreach efforts. To this end, we are involved in a number of Manchester-related activities. In 2000, we were proud to be among the founding members of the Canadian Manchester Terrier Club and, in 2002, lead completion of the breed's first ever North American Health Survey. We were also primary organizers of a North American breed study of Juvenile Cardiomyopathy, which resulted in a genetic test allowing breeders to eradicate the disease. It is our hope that through initiatives like this the CMTC can help to improve the health and overall quality of Manchesters being produced on this continent. 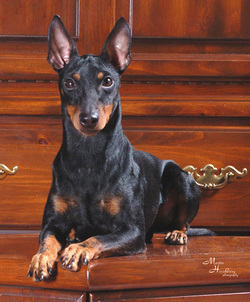 To learn more about the Canadian Manchester Terrier Club please visit their site! The unsung hero of the Fwaggle Team, Sean is the resident dog Dad, door man and chief table scrap sneaker at Camp Kelly. He can frequently be found cutting up toast to feed the TMTs, encouraging the dogs to pre-wash dishes, and generally ensuring that our dogs are safe and well-taken care of. We have been very successful in the show ring, but we value our dogs for more than just their beauty. No matter where their lives may take them, we believe that all dogs must always be pets first--and it is our job to provide our puppies with the tools they need to do that very special job. To accomplish this, we keep the number of dogs in our home low so we are able to provide each one with the individual love and attention they deserve. We health test our breeding stock and pay careful attention to things like genetic diversity. And we invest a great deal of time and energy working with each litter we produce ​to make sure our puppies have the foundation they need to become happy, healthy, well-socialized adults (read more about how the Puppy Culture program benefits our puppies). We also know that purchasing a puppy, whether for pet or show, is a huge commitment which is why we encourage puppy buyers to stay in touch. Our family's love affair with Toy Manchester Terriers has continued to grow over the past 30 years and we hope to be able to share some of our affection for this noble breed with you through our site. We are always interested in discussing this wonderful breed with interested parties and invite questions or comments.